First, just a quick note to let everyone know “The Trial of Lewis Thornton Powell,” the third novel in the Lincoln Assassination Series, is scheduled for release in five days. It is now available for pre-release on Kindle and the paperback will be arriving in book stores and available online shortly thereafter. 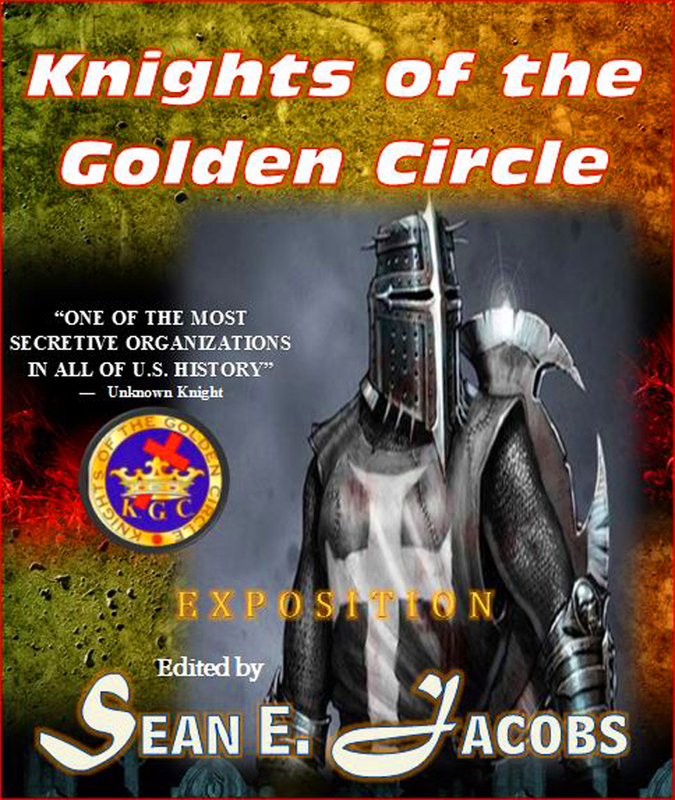 When I first began this six-book series, a new friend I met on one of my book tours, asked how much of my information was portrayed in my novels about an organization called “The Knights of the Golden Circle.” How secretive were they, so secret I could find very little information until recently. Did you know when Booth met a fellow member of the KGC, one of many secretive ways to introduce one self was not a verbal password, but rather to put your right thumb to the tip of your index finger giving a sign of “okay” and tap your middle finger to the top of your forehead. If the other party returned the same sign language, but with the left hand, one would know they were a fellow member of the organization. In writing the sixth novel in the series, “Conspiracy Theories in the Lincoln Assassination,” the subject matter of the KGC came to the forefront. Why not, a secretive organization such as the Knights of the Golden Circle create an atmosphere of conspiracy. Much of their contribution to the conspiracy theory cannot be proven true, but cannot be proven untrue either. Again, no proof, just a conspiracy theory, but did you know back in the dusty dog-eared archives of information there is some writings that claim Jesse James was a member. Another point of view about the KGC is that Secretary of War Edwin Stanton gladly took their money during his Democratic run for office and other endeavors. But, once he obtained his elevated position politically, just before joining Lincoln’s Administration, he flipped over to the Republican Party. During research of the KGC and their involvement in the Lincoln Assassination, it was discovered that Texas was one of the largest footholds of this secretive society. In preparing for this posting, I was reading the front page of the Austin American Statesman an article about about removing the Jefferson Davis statue from the University of Texas Campus because of his association, primarily, with slavery. I discovered that the statue of ole Sul Ross on Texas A&M Campus in front of the Academic Building fits the same mold of thinking as he was, supposedly, a member of the KGC organization. You see, this is how novels are born! I open the front page and there’s something from President Obama talking with the Governor of South Carolina about removing the Confederate Flag from the grounds of their capitol. There on the front page of the Austin American Statesman is an article that the Board of Regents have voted to remove the statue of Jefferson Davis to a museum. I have researched the number of statues around the South, and it is astounding at how many cranes will be called in for transport to ‘hidden’ places these heroes for the South. Let’s travel to Huntsville, Texas, and other places to, and there are large statues of General and Governor Sam Houston standing. Did you know he was, supposedly (would have to dig the archives for a while) a member of the KGC, this secretive organization which was initiated for the purpose of establishing a slaveholding empire encompassing the southern U.S., the West Indies, Mexico and other parts of Central America. Houston was ready and willing as Governor of Texas to annex Mexico and supported the cause, however he did not agree with the KGC’s anti-Union stance and refused to support their plans. Back to the newest novel being born. The writing of the sixth book on conspiracy theories is coming along fine and scheduled for release at the end of the year, just in time for Christmas. Chapter 17 reflects the conspiracy theory of the KGC as it is associated with the assassination of Abraham Lincoln. One must become familiar with sign language, special coding with numbers and symbols and other aspects of the organization to understand how they might be involved in the conspiracy. Then, I found the private booklet, published by the organization in 1861. To understand their position and how they operate, it became necessary that I type this book, add some editing for grammar and misspelled words, and instead of shoving it into a drawer somewhere, make it available for others following this series to read and learn about such a secretive organization. The “Knights of the Golden Circle” was strongest in Texas with “Castles” or local chapters in Houston, Galveston, Austin, San Antonio and thirty-two other cities and towns. Even La Grange, Texas had a chapter, a small community north of Columbus, Texas in Fayette County.